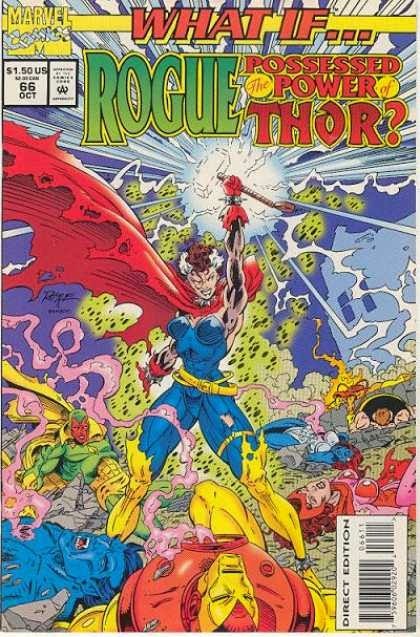 What if Rogue possessed the power of Thor? That title emblazoned on the cover, combined with the image of Rogue holding Mjolnir over the bodies of fallen Avengers caught my attention. This issue spins out of the events of Avengers Annual #10. Starting with members of the Brotherhood of Evil Mutants planning to escape from Rykers Island, Where Destiny starts to see multiple possible futures spreading out before her. From there it jumps to right after Rogue has drained most of the power from Ms. Marvel, and then gets a hold of Thor. In the original story Rogue only holds onto Thor for a short time, but in this timeline she holds on to Thor until he is completely drained. Thus giving her the ability to wield Mjolnir and bestowing her with all of the powers of Thor. The power overwhelms Rogue at first, but eventually it settles in and she becomes a threat to not only the Avengers but her friends in the Brotherhood as well. On Asgard Odin is furious about the death of his son and sends Volstagg, Hogun, Fandral, Sif and Balder to track Rogue down and stop her. On Earth members of the Avengers team up with the Fantastic Four to try to find a solution to the new threat. When Loki learns of the change in owners of Thor’s power he immediately goes to Rogue and talks her into helping him lead an attack on Asgard. However when the battle starts raging and the forces of Asgard combined with the army of Midgard’s finest superheroes square off with Loki and Rogue backed by an army of demons. Thor’s memories come rushing back to Rogue and she helps Asgard stop the invasion. The art of John Royle is really good. It has a early 90’s Jim Lee quality to it, and I think it makes the book better. Royle makes the story jump off the page for the most part, but with all Early 90’s art there are rough panels too. I wasn’t expecting very high quality for this issue. In fact I bought it just because it was in the 50 cent boxes of my local comic shop and it had to do with Thor. But I was surprised to find this to be a lot of fun.